KUALA LUMPUR (June 23): Malaysian palm oil futures fell to their lowest since December on Thursday morning on expectations for supply to rise on a seasonal production gain and exports to decline. Traders are forecasting rising seasonal output, and for exports in June to weaken from May. A stronger ringgit, palm's traded currency, also contributed to market losses on Thursday. Palm had earlier declined for nine consecutive sessions before paring losses for a day last Friday. It has since continued its decline, dropping for the past three sessions to fall 3.1% so far this week. Benchmark palm oil futures for September delivery on the Bursa Malaysia Derivatives Exchange fell 0.4% to RM2,365 (US$589) per tonne at the midday break, after earlier reaching a six-month low of RM2,351. Traded volumes stood at 28,031 lots of 25 tonnes each at noon. "There's weak sentiment as production is higher, exports are lower and the Malaysian ringgit is strengthening," said one trader from East Malaysia. Palm industry participants are forecasting higher June output versus a month ago, as fresh fruit yields increase in line with the growing season. Production typically reaches its peak in the third to fourth quarter of the year. Exports, however, are expected to decline this month after demand surged in May on Ramadan orders. The Muslim holy festival entails day-long fasts broken by communal feasting, incurring higher palm oil demand for cooking. Malaysian palm oil shipments fell between 8% and 10% in the first 20 days of June on sharp declines of exports to India, the world's largest consumer country of palm. The ringgit's rise to its strongest level against the dollar in six weeks also weighed on palm, making the vegetable oil more expensive for holders of foreign currencies. The ringgit rose 0.4% to 4.0175 per dollar on Thursday afternoon on some commercial demand in thin liquidity. It earlier reached an intraday high of 4.0040, its strongest since May 12. In competing vegetable oils, the Chicago Board of Trade soyoil contract for July fell 0.6%, while the September soybean oil contract on the Dalian Commodity Exchange declined 0.2%. The offer price for crude palm kernel oil was at RM5,274.54 per tonne <PKO-MYSTH-M1> at noon, according to price assessments by Thomson Reuters. KUALA LUMPUR (June 29): Malaysian palm oil futures fell to a six-and-a-half-month low on Wednesday morning, dragged down by poor fundamentals and a stronger ringgit, palm's currency of trade. Palm oil has been falling since the beginning of June, declining for the last three weeks and losing 9.2% so far this month. The tropical oil has been recording losses as traders forecast rising seasonal output in the coming months while exports for June have fallen after it peaked in May, ahead of Ramadan demand, contributing to rising stockpiles. Benchmark palm oil futures for September delivery on the Bursa Malaysia Derivatives Exchange dropped 1.6% to 2,340 ringgit (US$577) per tonne at the midday break. Palm earlier fell to RM2,333, its weakest levels since December 15. Traded volumes stood at 23,266 lots of 25 tonnes each. "Demand is low so exports are down while production is higher. Plus, we are seeing some ringgit appreciation today," said a trader in Kuala Lumpur. The ringgit gained 0.3% at 4.0580 per dollar around noon, making palm more expensive for foreign currency holders. Malaysian exports for June are seen declining compared with May, and will remain slow as the end of Ramadan approaches and until the next festive season of Diwali in October. Palm oil shipments from Malaysia fell about 10% in June 1-25 versus May 1-25, showed cargo surveyor data. Full month data is scheduled for release on Thursday. Muslims worldwide fast and hold communal feasts during the holy month of Ramadan, incurring more palm oil usage for cooking. The Chicago Board of Trade soyoil contract for December fell 0.4%, while the September soybean oil contract on the Dalian Commodity Exchange dropped 0.5%, on a US government report showing increased acreage for soybean crops this year. Soy's falling prices weighs on palm prices as it becomes more competitive as a substitute for palm. The offer price for crude palm kernel oil was at RM5,175.33 per tonne <PKO-MYSTH-M1> at noon, according to price assessments by Thomson Reuters. SINGAPORE (June 29): Palm oil may drop to RM2,017 per tonne in the next three months, as it has broken a support at RM2,390. The support was provided by the 50% Fibonacci projection level of a downward wave C, the third wave of a three-wave cycle from the March 4, 2008 high of RM4,486. The next support will be at RM2,017, the 61.8% level, a break below which could open the way towards the 76.4% level at RM1,557. This wave could be divided into five small waves, and the division suggests a completion of the wave C. The gain from the Aug 25, 2015 low of RM1,863 could then be regarded as a part of a long-term uptrend. Under this scenario, palm oil could end its drop around RM2,017 and then resume its uptrend. 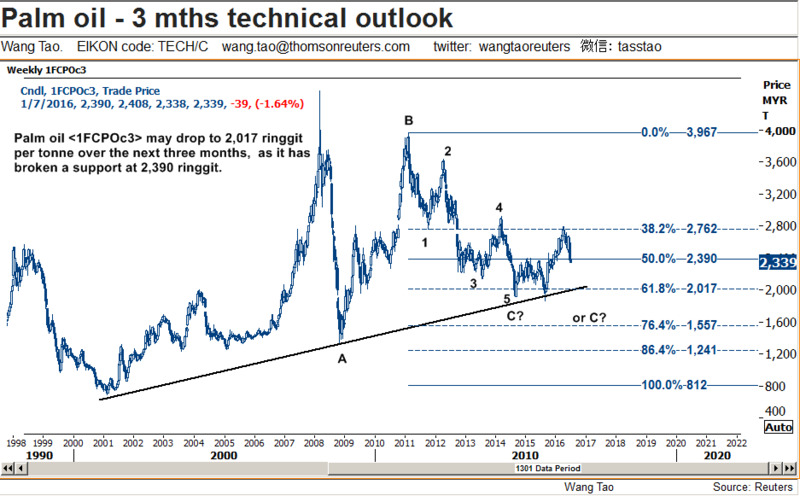 A break below RM2,017 could signal the extension of the wave C towards RM1,557, or to RM812, the 100% level. A Fibonacci projection analysis reveals the current drop is mathematically related to the preceding downtrend from the Feb 10, 2011 high of RM3,967. This analysis suggests a target at RM2,009, the 38.2% level, a break below which could cause a further loss to the 61.8% level at RM1,524, which is very close to RM1,557. PETALING JAYA: PublicInvest Research has maintained its “overweight” call on the plantation sector after palm oil inventories in June rebounded close to 1.77 million metric tons (mt) following six-month drops. “It is slightly above the consensus estimates of 1.72 mt,” its analyst Chong Hoe Leong said in a report yesterday. Chong said the crude palm oil (CPO) price has been under pressure lately, due to a stronger ringgit and unexciting inventory outlook in the near-term, which could help regain the buying interest from major consuming countries and will drive the country’s CPO exports demand. “We maintain our positive stance on the CPO outlook with an average CPO price forecast of RM2,500 per mt for 2016 and RM2,600 per mt for 2017,” he said. Last month, Chong said the average CPO price fell from RM2,619 per mt to RM2,539 per mt. Year-to-date, the CPO price averaged at RM2,510 per mt, which is slightly higher than the research house’s full-year estimate of RM2,500 per mt. “We think that the CPO futures has oversold as we foresee second half CPO price could average around RM2,450 per mt,” Chong added. Meanwhile, he said that the stock-to-usage ratio climbed from 8.9-10.4% as exports slide while production continued to recover. Palm oil exports declined 11.7% month-on-month (m-o-m) after rising 9.3% m-o-m the previous month. Chong said improved exports to the EU and Pakistan were outpaced by weaker demand from China, India and the US. “Nevertheless, we think that exports demand should improve in the following months as cheaper CPO prices could attract more buying interest from the major consuming countries,” he added. Last month, Chong said the CPO production had recovered by 12.3% m-o-m to 1.53 million mt, where Peninsular Malaysia and East Malaysia rose 8.9% and 15.8%, respectively. “We expect fresh fruit bunches production to improve gradually over the next four months. It will likely peak around September-October period,” he noted. According to product testing company Intertek Group plc, the country’s CPO exports rose 5.2% for the first ten days of July 2016, compared with a month earlier. Based on the MPOB reference price from June 10 to July 9, Chong said the average CPO price of RM2,468 per mt will likely see the CPO export duty reduce from 6-5% for the month of August. On a separate note, HLIB Research has maintained its “neutral” call on the plantation sector, with projected average CPO price of RM2,400 per tonne and RM2,500 per tonne for 2016 and 2017 respectively. “We believe inventory will inch higher in July 2016, taking cue from Jun 2016’s production figure (indicating that ‘mini peak’ has begun early and will sustain into the following month, if history repeats), and exports will likely remain weak (in the absence of seasonal demand and narrowed price spread between soybean oil and palm oil),” it said. SINGAPORE (July 14): Palm oil may retest a support at 2,182 ringgit per tonne, as suggested by its wave pattern and a Fibonacci projection analysis. The support is provided by the 61.8% Fibonacci projection level of a downward wave c, the third wave of a three-wave cycle from the June 7 high of 2,677 ringgit. This wave is capable of travelling to 2,044 ringgit, its 100% Fibonacci projection level. A Fibonacci retracement analysis on the uptrend from the Aug 25, 2015 low of 1,863 ringgit to the March 29 high of 2,793 ringgit reveals that palm oil has briefly pierced below the 61.8% level at 2,218 ringgit. Palm oil finished 1.9% higher at RM2,347 after touching a 2-week high of RM2,354. Palm oil up 1.8% on week, ringgit falls to 3.766 per dollar. Malaysian palm oil futures rallied to a 3- 1⁄2 week high despite a stronger ringgit. Palm oil contracts for August rose 0.9% to RM2,666 per tonne. Palm oil may rise into a range of 2,870-2,960 ringgit per tonne over the next three months. Local crude palm oil (CPO) exporters are becoming anxious. Since 2008, Malaysia's palm oil exports to China has more than halved from RM12 bil to RM5.3 bil last year. Not only that, China is also buying more CPO from our closest competitor Indonesia, and if market talk is true, it will further reduce purchases from Malaysia. At the same time, China is also purchasing more soybean oil from the US. Such a scenario will devastate the local palm oil industry. If China continues to switch from CPO to soybean, it will create a huge excess in supply which will create further downward pressure on Malaysian palm oil prices. Already, the CPO price is projected to range between RM2,000 and RM2,400 per tonne in the next six months. It is now around RM2,350. In 2008, China accounted for 25% of the country's CPO exports. But since then, diminishing demand has resulted in it accounting for only 13.6% of palm oil exports last year. Year-on-year (yoy) sales of palm oil to China fell 23% and 16% in 2014 and last year. Malaysia's RM10 bil CPO export to China accounted for 13% of total exports last year. For the full story, please subscribe to Focus Malaysia. KUALA LUMPUR (Aug 2): Malaysian palm oil futures dipped in early trade on Tuesday, set to snap two days of gains, tracking weaker rival soyoil on China's Dalian Commodity Exchange. Benchmark palm oil futures for October delivery on the Bursa Malaysia Derivatives Exchange dropped 0.1% to reach RM2,324 (US$574) per tonne at the midday break. Palm prices fluctuated early in the session, trading higher before falling to an intraday low of RM2,303. Traded volumes stood at 18,405 lots of 25 tonnes each on Tuesday noon. "Dalian opened down a fair bit but recovered... which made the (Malaysian palm futures) market recover from its low," said a trader based in East Malaysia, adding that the weaker ringgit was not enough to support palm prices. The ringgit, palm oil's currency of trade, was 0.7% weaker against the dollar at 4.0475 at noon on Tuesday. A weaker ringgit typically lifts palm prices by making it cheaper for holders of foreign currencies. Another trader said the market was trading within a range while waiting for new leads. While cargo surveyor data showed improving export demand for the month of July, a 12-15% improvement from June, output is seen rising in line with seasonal trend. Palm has been trading around eight-month low in the last three weeks, dragged down by weaker performing soy on Dalian and the Chicago Board of Trade. It declined 1.6% for a second monthly fall in July. Palm oil is expected to retest a resistance at RM2,343 per tonne, according to Reuters market analyst for commodities and energy technicals Wang Tao. In related-vegetable oils, the Chicago soybean oil contract for December rose 0.5%, while Dalian's January soybean oil contract declined 0.2%. PETALING JAYA: The plantations sector is expected to see stronger earnings in the second half of the year (2H16) on output recovery, according to MaybankIB Research. With the exception of Felda Global Ventures Holdings Bhd (FGV), which posted a core net loss of RM75 million in 1H16, the other planters' (those with December financial year end) core earnings met 28%-59% of the research house's full-year core net profit forecasts. "We expect 2H16 earnings outlook to be significantly better largely on seasonally higher FFB (fresh fruit bunch) output while CPO (crude palm oil) ASP (average selling price) remains stable. Most companies (those with December FYE) had a dismal 1H16 output and following revisions to our FFB output assumptions (on fresh guidance by management), they represent 38-43% of our full-year assumptions. This implies that 2H16 output will grow 50% (from 1H16). Meanwhile, the recent rally in palm kernel (by-product) prices will also lift overall margins in 2H16," said MaybankIB in a report. It said the low output was the key reason for the weak 2Q16 results, which were mixed. Out of the 10 stocks under MaybankIB's coverage, 30% was above expectations, 40% fell short, and 30% in line with expectations. Overall 1H16 FFB output was weak. "We expect earnings to play catch up in 2H16 with 50% (from 1H16) output growth, supported by stable CPO ASP, and high palm kernel prices. However, at 28 times the 2016 and 24 times the 2017 price-to-earnings ratio, we believe the Malaysian planters have largely priced in the earnings recovery. We prefer Singapore and Indonesia listed planters for their cheaper valuations," said MaybankIB. It is staying neutral on the sector as it does not anticipate the present high spot CPO price of RM2,800 per tonne to be sustainable going into the peak production months of September-November 2016.